SLA MANAGEMENT– A calendar is needed to escalations or analyzes to calculate based on business hours. Define a “standard” calendar which system-wide is valid. Only in the stated business hours escalation alerts are sent to agents. Have you for what you have to comply with different customer business hours, you can create multiple calendars. The assignment to the customer tickets done by the SLAs. TICKET SELECTOR: – Create rules that single out the ticket for services level agreement. 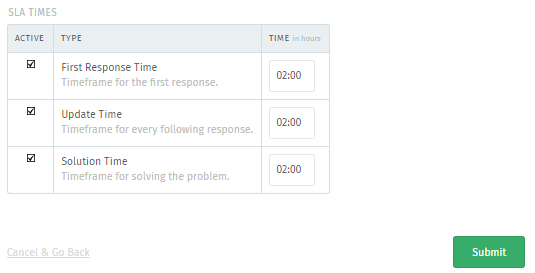 SAL TIMES: – In here you can select ticket first response time, update time, and solution time. First Response Time- set the time frame for the first response of ticket like “2 hours”. Solution Time- set the time frame for solving the problem.